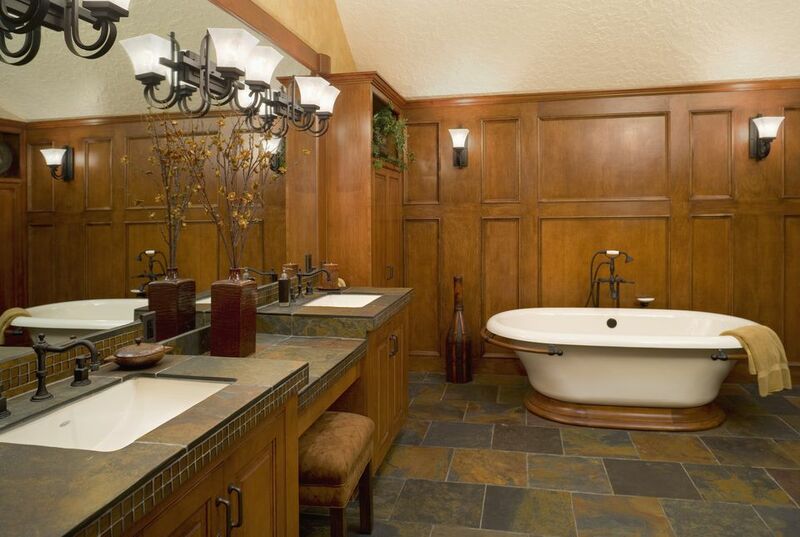 Among flooring materials, none is more elegant and luxurious than natural stone. The term "natural stone" refers to a variety of mountain-born mineral substances that stand in contrast to any synthetic or manufactured stone products. Common natural stone flooring includes slate, marble, limestone, travertine, granite, and sandstone—each of which has slightly different properties. It's important to understand the characteristics of the type of stone flooring tile you are purchasing in order to determine whether it is appropriate for a specific location. As you shop for natural stone tiles, these are a number of general factors that you should consider. Non-vitreous: This is the highest absorption level. In most cases, non-vitreous tiles should not be used in any damp environment. Semi-vitreous: While these tiles are less absorbent, the more liquid they are exposed to, the more maintenance they will require. Vitreous: This is the standard absorption level for flooring tiles and these materials are generally considered appropriate for most low- to mid-traffic indoor and outdoor applications. Impervious: These materials are resistant to the absorption of liquids and thus will be easier to maintain. They are often used in high-traffic commercial applications. Grade 1 refers to high-quality, uniform materials. Grade 2 consists of materials with minor defects, such as chips, scratches, or irregular surfaces. Grade 3 materials have major flaws in size, shape, surface, or chipping, making them appropriate only as accent pieces, or in certain rustic decorative applications. This measures how slippery various materials are. The higher the coefficient, the more traction a tile will have. This number is especially important in moist environments such as bathrooms and kitchens, as well as high-traffic commercial areas. The Americans with Disabilities Act requires that flooring material has a minimum of a .6 dryness coefficient. Some natural stone flooring materials are more suited to outdoor applications than others. Many of the factors above will determine whether a material should be used in an open air environment. Non-vitreous materials will be subject to staining through dirt and acid rain, as well as cracking when absorbed materials freeze and expand. Stones which have a low coefficient of friction will also pose a slipping hazard during rain and snow storms. Each piece of stone is a unique creation of the earth, making every flooring application one of a kind. Every floor is entirely unique. The mountain-born qualities of the stone can help to give living spaces a direct and eternal connection to the natural world, unlike any other building material. Stone tiles are natural, nonpolluting, eco-friendly pieces. Purchasing stones which were acquired locally can cut down on the environmental impact of transport. With the exception of granite and some slate, natural stone is quite porous and needs to be treated with a sealing agent periodically to protect its surfaces. Some stones are very brittle and will chip easily. When purchasing natural stone flooring materials it is important to do your research and understand the characteristics of the material you are purchasing. Find out whether it is appropriate for your specific application and how much maintenance it will require. Ask your retailer questions, and thoroughly research the stone before you make a purchase.